Check out our amazing offers at The Butterfly Hotel, and remember to book quick as they sell out fast! The Butterfly Hotel always offers fantastic value for money all year round, but we like to treat our new and regular guests to even better deals and special events. Grab a great deal today! Join us for our ultimate 80's weekend! Only £80 per person for 2 nights. 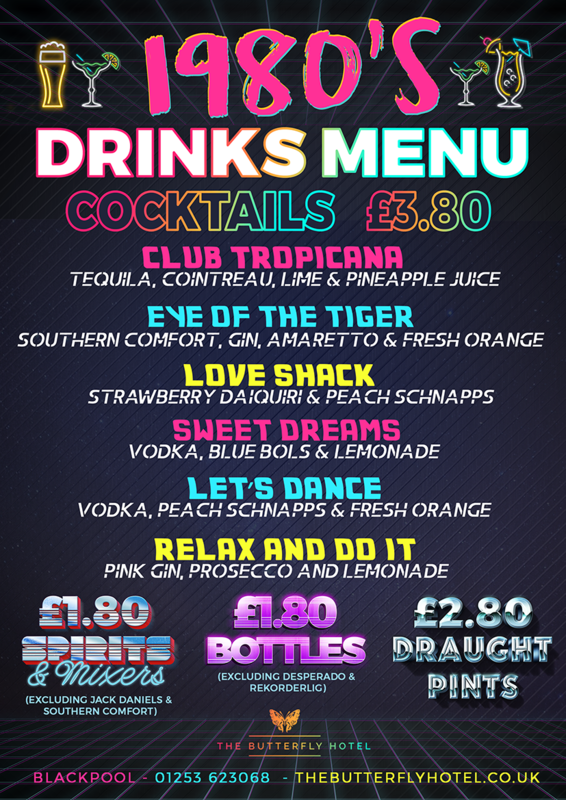 This amazing deal features awesome drinks offers all weekend, a delicious buffet, sweet stand, Live DJ & 80s Hits and a late check-out. We also have a Karaoke competition with a bottle of Prosecco for the winning singer, plus a Fancy Dress competition with the winner grabbing a free nights stay for 2 people! Bar opens 12 Noon till 6 am on Friday. Bar opens 4:30pm till 6 am on Saturday. Only £80 Per Person for 2 Nights! 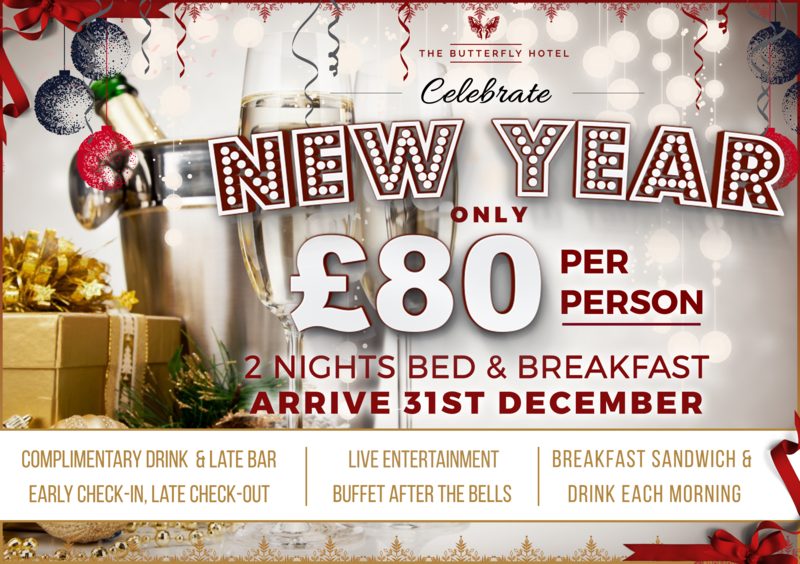 See in the New Year in style at The Butterfly Hotel with our amazing offer. This fabulous deal includes a 2 night stay, complimentary drink and live entertainment on New Years Eve. We also have a delicious buffet after the bells, breakfast sandwich & drink both mornings & an early check-in & late check-out. Book now to secure your place!. Let's go girls! It's Ladies Weekend 2020!. Only £80 per person for 2 amazing nights. 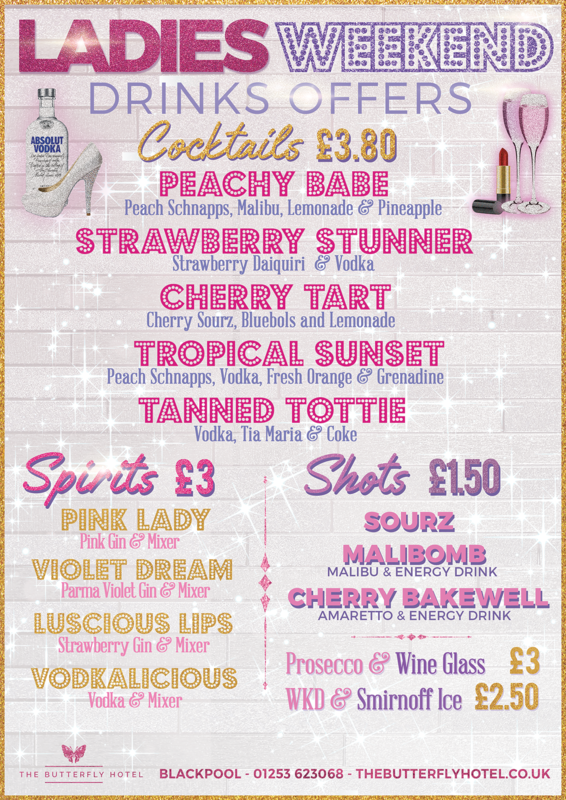 Featuring discounted drinks offers all weekend, pizza & games night, our gorgeous naked butler, a live saxophone player, karaoke competition, fancy dress and a late check-out on Sunday. Bar opens 2 pm till 6 am on Saturday.